The good news is orchids don't need a rain forest to grow. Being the tropical creatures that they are, orchids grow best with at least 40% humidity however. Maintaining 40% humidity levels can be a challenge in the winter. The problem is your furnace. As it heats the air, it's also baking out the moisture. During winter months, central heating systems push out hot, dry air hour after hour to keep room temperatures comfortable. Maintaining 40% humidity under these conditions is nearly impossible. Many homes in cold climates have humidity levels as low as 10% during winter months! Low humidity makes life difficult for orchids (10% humidity levels are normally found in the desert!). If your humidity is less than 30%, you're going to have to make some adjustments (you'll be more comfortable with higher humidity levels too!). A good way to measure humidity is with a Hi/Lo Thermometer (also called a maximum/minimum thermometer). Ours not only show the current temperature and humidity, they also record the highest and lowest levels over time. "Stop guessing and start measuring - you'll instantly become a better grower!" 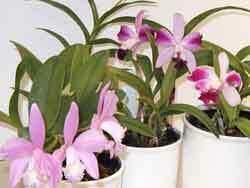 Our hydroponic system has several advantages for growing orchids in low humidity. 1. With hydroponics the water in the pot is not only nurturing the plant, but it's also evaporating into the air, raising humidity levels (at the base of the plant where it does the most good!). 2. Plants tend to dry out faster in dry air and require more water. This makes watering a real guessing game. With our system, correct watering is easy because the water gauge tells you when (and how much) to water - no more guessing! Misting is great for people who think they always "need to do something" for their plants. But it doesn't accomplish much. Unless you mist your plants every 20 or 30 minutes, you're not raising the humidity because the moisture from misting evaporates quickly. Misting is a poor solution - you need to consider other options. Grouping your plants together raises humidity levels somewhat. This is especially true for plants growing in hydroponics because the water in the pot is not only nurturing the plant, it's also evaporating into the air, raising humidity levels (at the base of the plant where it does the most good!). Warning: Don't confuse humidity (moisture in the air) with water in the pot. Watering your plants more to create humidity is a sure way to kill your orchids. Humidity Trays are light weight, plastic trays that display your plants on a grid that sits above a water reservoir. As the water in the tray evaporates, the humidity around your plants increases. Assembling your plants on Humidity Trays creates a micro-climate that increases humidity in two ways. 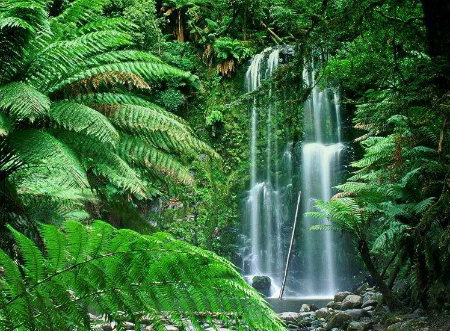 First, moving your plants together naturally increases humidity. In addition, the water evaporating from the Humidity Tray gives your plants a real humidity boost. This is a big one!! And you'll save money! Humidity levels are closely tied to air temperature. To promote higher humidity during winter months, try turning down the thermostat a few degrees, especially at night. Both you and your plants will be healthier! Most orchids are content with evening temperatures as low as 50-55 degrees, So don't worry about your house being too cold. You'll be uncomfortable long before your plants will - even the "warm growers". Likewise, in the summer, orchids enjoy the natural, warm, humid air from the outside. Air-conditioners make us more comfortable by cooling the air and removing moisture. Orchids have a hard time tolerating cold air drafts from air-conditioning because the air has been robbed of its natural humidity. 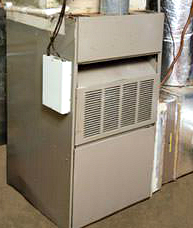 A room humdifier is also a very good solution to low humidity. Cost becomes a factor with this option however. An evaporative-pad humidifier is better than a mist humidifier, because, unlike a mist humidifier, it doesn't leave your orchids with a white film (from the minerals in the water being deposited on the leaves). Using humdity trays and a room humidifierand lowering the temperatures at night is by far the best solution to low humidity. And that's good news for both you and your orchids.